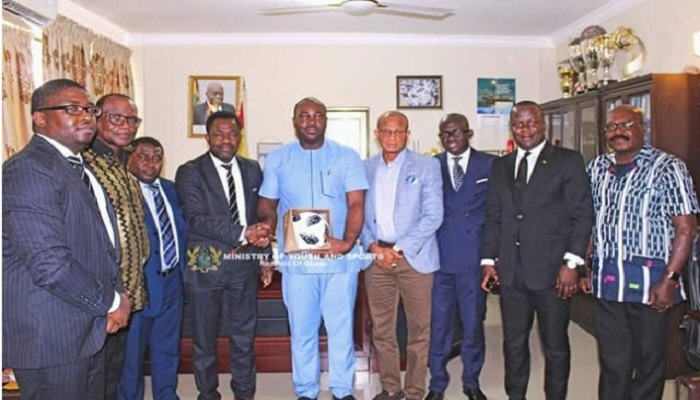 The Federation of International Football Association (FIFA) in consultation with the Government of Ghana has resolved to put in place an interim measure to allow for the continuation of football in Ghana. This is one of four resolutions agreed after a meeting between officials of FIFA and government of Ghana, Friday. The meeting was occasioned by government’s intervention in Ghana football following revelations of alleged bribery and corruption by some referees and football administrators by ace investigative journalist Anas Aremeyaw Anas. The revelations have led to FIFA imposing a 90-day ban on the president of Ghana Football Kwesi Nyantakyi on all football activities with the possibility of another 45-days ban if investigations are concluded. Mr Nyantakyi has since resigned as President of the FA as well as other positions in WAFU and CAF. But government does not appear to be satisfied with the resignation by the FA president. It has, with an order of the court, put a 10-day injunction on all football activities in Ghana as it takes steps to liquidate the Ghana Football Association. Lawyers for the FA have described government’s action as illegal and have vowed to resist any attempt by government to disrupt business activities of private football administrators. The frosty relations between government and the FA have led to speculations FIFA may ban Ghana from all football related activities as it frowns on government interference in football. However, a three-man FIFA delegation has come to Ghana to chart a way forward for Ghana. The team led by FIFA Director, Africa & the Caribbean, Veron Mosengo-Omba met with the Sports Minister Isaac Asiamah, Information Minister Mustapha Hamid and other key government functionaries. “Both FIFA and the Ghanaian government have a zero tolerance for corruption, criminality and all other forms of illegality,” the statement said. The statement added that Ghana government will continue discussions with FIFA in Zurich, Switzerland, for the purpose of finalizing interim arrangements regarding football in Ghana. Having already formed a five-member government committee headed by Dr Kofi Amoah to manage football in Ghana, it is not clear yet what the status of that committee will be.